Pinot Noir is a red wine that is typically light to medium bodied and fruit-forward. Originating from Burgundy, it holds a pleasant spot in the red-wine spectrum—not too dry, but certainly not sweet. This is why it's a favorite the world over. Pinot Noir is a fascinating wine. From growing the grapes to exploring its global range, key winemakers, and perfect food pairings, there's a lot we can learn about this much-appreciated red wine. Pinot Noir (pronounced Pee-noh n'wahr) is Burgundy's most famous noble grape. Known and loved as "Red Burgundy" in much of the world, Pinot Noir is among the most elegant wines to come out of France. Today, Pinot Noir grapes are planted in regions around the world, including Oregon, California, New Zealand, Australia, Chile, France, Spain, Germany, and Italy. The wine's diverse geographical range means that you might also find it labeled as Pinot Nero, Blauburgunder, or Spätburgunder. 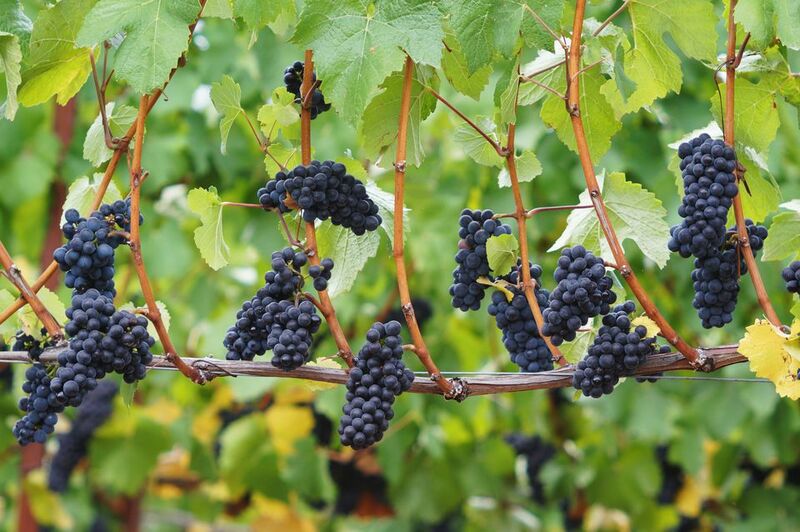 Pinot Noir may be the toughest grape to grow, but the effort is often well worth the constant care and investment. It is a fickle grape that demands optimum growing conditions, preferring warm days consistently supported by cool evenings. The aging potential for most Pinot Noir doesn't compete with Cabernet Sauvignon and some of the most tannic reds. The stronger build of those other grapes makes for a more age-worthy wine. This is why you may notice that Pinot Noir tends to be younger than other reds. Pinot Noir is a dry red wine. It typically exhibits a fruit-forward character, with strawberry, cherry, raspberry, and blackberry dominating the palate. Notable earth-driven layers are also quite common in a glass of Pinot. Herbs, mushroom, leather, and game-like qualities are fairly familiar. Warm spice notes also make their way into the profile, often in the form of cinnamon, clove, and smoky tobacco nuances. Pinot Noir offers a red-wine palate profile in a white-wine style. The lighter-bodied, rich fruit character components of many Pinots give it a step up in the glasses of both red wine and white wine drinkers. Pinot Noir is well-suited to pair with a wide variety of ethnic dishes, classic cuisines, and traditional foodie favorites. This versatility is due in large part to its consistent acidity, subtle and silky tannins, and lighter-bodied style. Perfect Pinot Noir pairings include pork and poultry, beef and bacon, cheese and chocolate, fish, lamb, mushrooms, fresh herbs, and wild game. Pinot Noir plays well with creamy sauces and spicy seasonings as well. Due to the stringent growing requirements for Pinot Noir, it is produced in much smaller quantities than other popular red wines. Traditionally, you will also pay a little more for a great Pinot Noir, as the “supply and demand” theory kicks in. There are several producers in the $10 range that are worth checking out. Mark West, Robert Mondavi Private Selection, Cupcake, and Mirrasou are among the best budget Pinots. For more expensive options, look for bottles from Domaine Faiveley of Burgundy or Craggy Range of New Zealand. As for American producers, you'll love the Pinot Noir from greats like California's Gary Farrell, Emeritus, and La Follette. Oregon has some top-ranking wines as well, from wineries like King Estate and Stoller. There are many other key producers to look for. If you'd like to try a Napa Valley Pinot Noir, look to Bouchaine, Domaine Carneros, Etude, or Saintsbury. Compare those with the Sonoma County wines of J Vineyards and Sebastiani or the Russian River Valley gem of MacMurray. Other California greats can be found from Cambria, Calera, David Family, and ForeFront by Pine Ridge. Oregon has many equally impressive Pinots. From this state, turn to wineries such as A to Z Wineworks, Adelsheim, Amity, Archery Summit, Argyle, Bethel Heights, and Domaine Drouhin. For your exploration of international Pinot Noirs that are not from Burgundy, you'll find Chile's Cono Sur to be surprisingly pleasant. New Zealand's Villa Maria is another noteworthy name to look for. While this gives you many options to explore, feel free to try any Pinot Noir you come across. You'll find some spectacular wines produced throughout the world. In fact, there are so many that this style of red alone could keep you busy for years.